I’m no mathematician, but by my calculations I’ve slept the past 33 nights in 22 different places. That means I’ve zipped and unzipped and rummaged around in my kit bag at least 66 times (23 times with a torch clutched awkwardly between my teeth, because I haven’t been sensible enough to buy a head torch). It also means I’m tired of wearing the same clothes over and over, but I’ve realised that I can get by with a lot less than I thought I needed. Over the past 34 days I’ve dragged my bag by bus, plane and car across Spain to the Netherlands, Kenya and South Africa. It’s been carried by polite porters into luxury lodges; it’s been a bench at hot, dusty bus stops; and it’s weighted down our tent on wild, windy nights. And I unpacked it (sort of) only once, when we spent three nights at a beautiful beach retreat. For the past 12 years I’ve always carried a backpack, but this past month I’ve been using a sturdy kit bag with strong wheels – it’s so much easier to travel with, and more kind to my body. It has a few compartments which are useful for organising gear – to keep dirty laundry separate; a section for underwear; a section for things I need to access regularly. I’ve been wearing the same few clothes for the past six months, and have learnt the value of spending a little more on clothes that are really good quality – because when you wash and wear them again and again and again, it’s good to know they won’t fall apart or look like they’re years old. And buying clothes made from fabric that doesn’t crease easily makes life so much simpler. The most useful piece of clothing in my pack? A pair of utility pants I bought from Cape Union Mart eight years ago, which I roll into ¾ pants when it’s hot. There are four pockets on each leg, which are the perfect size for holding lenses, lens caps, credit cards and passports. You won’t find them on a catwalk in Milan, but – stylistas might disagree – when I wear them with pretty pumps (which pack flat), a colourful scarf and a denim jacket, I can walk a trendy city street without looking like I’ve just left the barracks. Probably the most useful things you’ll ever pack. I travel with at least two sarongs, so that one can get dirty or be used as a beach towel while the other is a back-up that can be used as a bath towel, sheet, scarf, skirt, dress, curtain etc. No matter how small, underwear can take up a lot of space in your bag, so I always pack some washing powder in a zip-lock bag, and take my travel washing line. It’s far cheaper to wash your smalls in a hotel bathroom than to send them down to the laundry. Many small hotels, shower rooms and camp sites don’t have much shelf space, so it’s useful to have a toiletry bag that you can hang it up. Buy good, salon-quality shampoo from your hairdresser and decant that into a small bottle. You need to use less of it, so you can pack less. My hair is short so I don’t need all that much anyway, but in the past three months I’ve used one 75ml bottle only. And I wash my hair every day. In many areas tampons are a luxury or they’re not used at all, so the chance of finding any in the dusty back roads of, say, Kenya is slim. Li’Lets obviously take up very little space, and Tampax’s new-ish “Compact” range is also a great space-saver. Store them in a plastic container in your suitcase – a cardboard box could get squashed or wet. 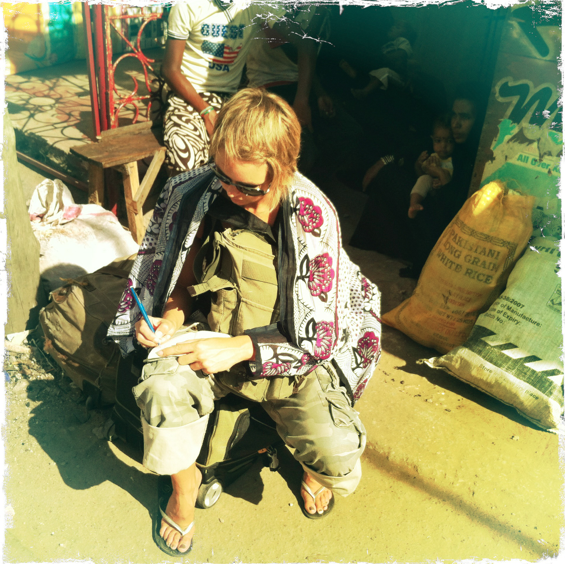 Next article“Fear and loathing” in Lamu? Yes! Wet wipes – great one to add to the list. Especially ones that reseal properly. I had a pack in Kenya that didn’t seal well, and they dried after a day. A menstrual cup eliminates the problem of packing (and disposing) of tampons. Keep hand sanitizer for those times when a sink isn’t available. Carry individual packs of tissues for toilets that have no paper, as in Japan. I think that’s why street hawkers give them out on every corner.